Are Verizon Customers Dropping More Calls? Here is a letter a from a 10 year Verizon customer in Virginia, who wrote to customer care. This issue has been escalated to the President level in the organization to resolve the problem. This an example of what is happening for millions of Verizon customers who previous had good coverage and are now suffering from more dropped calls. It just so happens that this customer is very persistent about getting the problem resolved but not everyone has the time or the skills to do this. Nor does Verizon have the resources to pursue every customer service problem in this manner. It is worth reading and just another reason that the the current theoretical wireless coverage maps should be outlawed? Its false marketing and degradation once good coverage areas is becoming big problem now that Verizon is moving to 4G / LTE. Wireless networks are breathing more than ever to optimize network capacity and thus why you might see 5 bars and then none standing in the same location. Read the full letter below about a Verizon trouble ticket resolution and please share any other examples in comments or send us an email. Is it possible to request a physical visit to the area in question (below), with measurements taken and reports made? My family and I drive this area a total of 12 times or more per day. We have been doing that for over ten years. WE HAVE NEVER HAD ONE DROPPED CALL IN THIS AREA FOR ALL THOSE YEARS. Why did we begin to drop most calls, suddenly, two months ago? I am specifically speaking of my driveway, 123 XYX Drive. Could an area suddenly, as if by magic, become "marginal", after working well for all those years? My suspicion is that Verizon, by upgrading to the higher "G" coverages and has made equipment changes in this area. 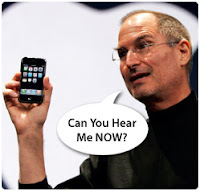 This new equipment places voice communication second to all the other services which the new smart phones sell. I believe that is what has caused my problem on 123 XYX Drive, etc. I'd like to have a definitive answer, from Verizon, not some nonsense about secondary coverage areas, explaining why I still get a five bar signal AND drop calls all the time? That doesn't sound like a coverage problem. It sounds like a Verizon equipment problem to me. As far as being in a marginal coverage area, I've seen Verizon make those claims before. Any problems Verizon doesn't want to address are suddenly in a marginal coverage area. This map below is location 123 XYX Drive. As stated above, coverage just perfect for ten years. Suddenly, two months ago, signal stays the same, calls are dropped constantly. Is it magic? 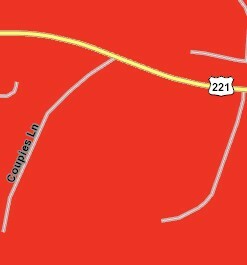 Below is another paste from the same Verizon coverage map showing the four mile area east of my driveway on Rt. 221 where past wonderful coverage has degraded to many dropped calls with no loss in signal. The last pasted map below is an area which Verizon knows is bad and has elected not to fix it. We get dropped calls in that area on a daily basis. 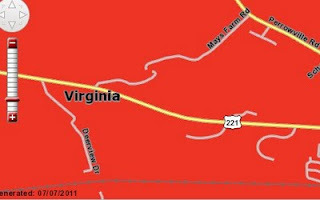 The specific area is on 221 between Mays Farm Road and the upside down question mark looking little road, just east of the 221 shield. To quote Verizon's answer on past complaints for the area, "This is an area of known problems." That's it, no fix date, no nothing. Please re-submit my complaint to the proper parties and include these Verizon coverage maps. I really would appreciate some sort of meaningful answer regarding the sudden degradation in service. Feel free to email me back with any other questions or concerns and we can move forward or see what the next step may be. From previously speaking to members of our Network Repair Bureau, I have been told that coverage can change. The majority of the time the coverage is increasing but I’ve been told that may not always be the case. I’m going to forward your email over to one of our NRB representatives and try to re-escalate this issue. I’ll email you back once I receive additional info about this problem. I also wanted to make sure that you were still marking the affected calls by dialing ### - SEND. Unfortunately I've been doing ***** Send, or something close to that. Does it matter as long as I do something strange after a dropped call or do you want exactly ###SEND? Sorry for the error. The coverage matter is a convenient out for Verizon. 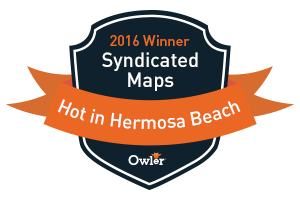 Their disclaimer really removes any value from the coverage maps they issue. (These Coverage Locator maps depict predicted and approximate wireless coverage. The coverage areas shown do not guarantee service availability, and may include locations with limited or no coverage. Even within a coverage area, there are many factors, including customer’s equipment, terrain, proximity to buildings, foliage, and weather that may impact service. Some of the Coverage Areas include networks run by other carriers, the coverage depicted is based on their information and public sources, and we cannot ensure its accuracy.) This really makes any coverage argument totally invalid and a waste of time; except, of course, for Verizon to put forth as an unreal sales tool. However, I might think that the cessation of service is a valid argument, and, as "supplier", Verizon would be held liable to continue the past level of service, unless they announce a change. In this instance, no change was announced to me. I guess, unless they do something for me, my only recourse is to leave Verizon and go over to US Cellular who, according to "hearsay" has this area buttoned down tight. As you see from my record, I don't often change carriers, so I'm loath to do that. Do let me know about the ##### or the *****. Lots of developments. After calling both Wireless and Landline executive offices at Verizon, a work order for both of my problems was issued and has gone away. A Verizon engineer surveyed my area of dropped calls and found that the PN on a tower about 18 miles away, was taking my calls and disconnecting them. They finally agreed on a new PN and the dropped calls problem is solved! The more annoying problem is still in the works. That's the one where all calls, originated from a Verizon cell phone, within my area, showed "out of area" on my land line caller ID. If I called my Verizon landline from the same room, with my local Verizon cell phone, the land line caller ID showed "Out of area". This is annoying because "Out of area" calls are usually from sales people and we never answered them. Now, seeing it might be one of us calling, we get to speak to an inordinate amount of sales people! Emily's note from Sprint is very pleasing. Not only does she seem to really care, but she is also reaching out across the Country. Not too many people around like that anymore. Sprint has always had minimal coverage in our area. I do not know what she's referring to when she says "granular detail", I've not heard that term used before. I'll give her a call, but, don't hold out much hope - unless they've increased their coverage.